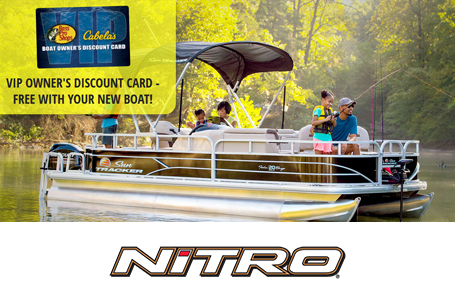 2019 Nitro Z18 with a Mercury 150 Four Stroke & single axle trailer. It is based on our revolutionary NVT™ hull with Rapid Planing System™, giving you a smooth, soft and dry ride along with a brisk holeshot and precise handling when turning and at the top end. The interior of the Z18 is laid out to provide the ultimate in fishability, with Z-Core seating system with Force Flex suspension for the most comfortable ride possible. Bottom width: 6 ft. 3 in. Max. person weight: 550 lb. Average package weight: 3200 lb. Package height: 6 ft. 4 in. Towing length: 24 ft. 1 in. Storage length: 21 ft. 3 in. Lowrance® Elite-9 Ti (flush mounted). Lowrance® Elite-9 Ti (RAM® mounted). Lowrance® Elite-12 Ti (flush mounted). Lowrance® Elite-12 Ti (RAM® mounted). Lowrance® HDS-7 Carbon w/StructureScan® (flush mounted). Lowrance® HDS-7 Carbon w/StructureScan® (uninstalled). Lowrance® HDS-7 Carbon w/StructureScan® (RAM® mounted). Lowrance® HDS-9 Carbon w/StructureScan® (RAM® mounted). Lowrance® HDS-9 Carbon w/StructureScan® (flush mounted). Lowrance® HDS-12 Carbon w/StructureScan® (flush mounted). Lowrance® HDS-9 Carbon w/StructureScan® (uninstalled). Lowrance® HDS-12 Carbon w/StructureScan® (RAM® mounted). Lowrance® HDS-12 Carbon w/StructureScan® (uninstalled). Humminbird® HELIX™ 9 SI G2N w/GPS (RAM® mounted). Humminbird® HELIX™ 9 SI G2N w/GPS (flush mounted). Humminbird® HELIX™ 10 SI G2N w/GPS (flush mounted). Humminbird® HELIX™ 9 SI G2N wGPS (uninstalled). Humminbird® HELIX™ 10 SI G2N w/GPS (RAM® mounted). Humminbird® HELIX™ 10 SI G2N w/GPS (uninstalled). Humminbird® HELIX™ 12 SI G2N w/GPS (RAM® mounted). Humminbird® HELIX™ 12 SI G2N w/GPS (gimbal mounted). Humminbird® HELIX™ 12 SI G2N w/GPS (uninstalled). NEW Humminbird® SOLIX™ 10 SI (flush mounted). NEW Humminbird® SOLIX™ 10 SI (RAM® mounted). NEW Humminbird® SOLIX™ 10 SI (uninstalled). NEW Humminbird® SOLIX™ 12 SI (flush mounted). NEW Humminbird® SOLIX™ 12 SI (uninstalled). NEW Humminbird® SOLIX™ 12 SI (RAM® mounted). Garmin® GPSMAP® 942xs chartplotter (RAM® mounted). Garmin® GPSMAP® 942xs chartplotter (flush mounted). Garmin® GPSMAP® 7607 chartplotter (flush mounted). Garmin® GPSMAP® 942xs chartplotter (uninstalled). Garmin® GPSMAP® 7607 chartplotter (uninstalled). Garmin® GPSMAP® 7607 chartplotter (RAM® mounted). Garmin® GPSMAP® 7608 chartplotter (flush mounted). Garmin® GPSMAP® 7608 chartplotter (uninstalled). Garmin® GPSMAP® 7608 chartplotter (RAM® mounted). Garmin® GPSMAP® 7610 chartplotter (RAM® mounted). Garmin® GPSMAP® 7610 chartplotter (flush mounted). Garmin® GPSMAP® 7610 chartplotter (uninstalled). Garmin® GPSMAP® 7612 chartplotter (flush mounted). Garmin® GPSMAP® 7612 chartplotter (RAM® mounted). Garmin® GPSMAP® 7612 chartplotter (uninstalled).